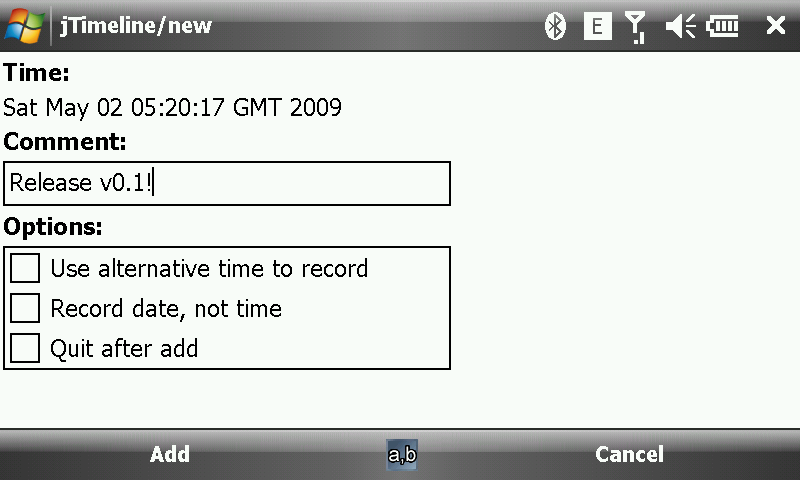 The idea is quite simple: record a time for future reference. When you woke up in the morning, you may need to check the time you went to bed to know how much time you slept. That's why I wrote this app. In addition, you may also need to remember when is the last time you take your pet to the doctor, when is the last time you clean the house, or when is the last time you take the pill... You can blog/twitter about them, or just record your personal timeline. The current version is 0.1, it's still in the PREREVIEW stage, see the changelog for more info. Download it here, and do remember to check the signature of your download. For old archived versions, see the download list. An icon is needed, call for help.